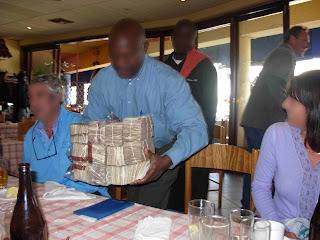 Our best friends in Zimbabwe sent us this photo of some friends of theirs paying the bill for a meal out. The party of 8 had two courses and a few beers which came to Z$6million which they paid using Z$1000 notes. If it wasn't so tragic it might be funny but it really isn't anything to laugh about. Our friends in Zim really need your prayers, life is really tough with even the most basic of food items being scarce and very expensive. How we long for change in that amazing nation!